Heather Neary was named President of Auntie Anne’s in November 2015. Heather joined Auntie Anne’s in 2005 and has held various roles in the company in which she was responsible for the oversight of marketing, communications, the franchise business consultant team, research and development, product innovation, and the franchisee leadership team. Most recently, Heather served as Vice President, Global Marketing. Prior to joining Auntie Anne’s, Heather held roles in marketing and as a managing editor for a business magazine. Heather received a B.A. from Millersville University and an M.B.A. from Penn State University. She serves on the Board of Directors for the Lancaster YMCA and the Board of Advisors for Penn State Harrisburg. I am a consummate learner. I’m always watching and learning from everyone around me – my direct reports, my bosses, and people in my personal life – husband, kids, and parents. I’ve remained close to a number of former colleagues and frequently reach out to them for advice. I read a lot, always looking for nuggets of wisdom. I encourage my team to do the same and share key learnings. By constantly learning, I’m able to consistently grow. My drive definitely sets me apart from others. I never settle and don’t accept anything less than the best from myself. When I started at Auntie Anne’s in 2005, my CMO sat me down to have a “career planning” session. She asked me where I wanted to be in five years and I boldly, and perhaps a little obnoxiously, told her I wanted her job. When she left the company three years later, she recommended me for the job, which I was ultimately offered and accepted. While I was happy to be CMO, I wasn’t satisfied, so I set a personal goal to be a president of a company by 40. When I had the opportunity to become president at Auntie Anne’s, I was 40 and seven months. While I missed my goal just slightly, if I hadn’t set the goal to begin with, I wouldn’t have achieved it. Auntie Anne’s has a very special legacy and I aspire to honor that legacy by making it the best food company in the world. We already have the best people and the best product. We have so much low-hanging fruit that we can tap into to achieve even greater results for all our franchisees. I’m excited to be on this journey. First and foremost, my relationship with my husband is my biggest success. In nearly 20 years together, we’ve been through a lot and I’m incredibly humbled to continue to be in love with such an amazing guy. Becoming the president of Auntie Anne’s, a company for which I have incredible passion and respect, is my biggest professional success. I’m honored to build on the legacy of “Auntie” Anne Beiler and hope to lead the brand to new heights. There are times in anyone’s career when you know you’re making the right decision, but you struggle with the personal impact it has on the people on your team. When I came into this role in November 2015, I knew I had to make some personnel changes. I had to make some cuts that impacted people’s lives, people’s families. I don’t take that lightly and it was an incredibly difficult time for me. I know it was very tough for the people who were impacted and I think about these people to this day. Auntie Anne’s always has been and always will be about the people. I believe very strongly in this approach because without strong people on our team, we don’t have a team. I take my role seriously and while I know I made the best decision for the long-term, it was an incredibly challenging moment for me professionally and personally. Work hard, play hard. You have to have fun in what you do, so while we spend a lot of time growing the Auntie Anne’s brand, we also make sure we have fun in the process. I’m fortunate to work with some amazing colleagues that I can also call my friends. First is our founder, “Auntie” Anne Beiler – yes, she’s a real person! While she is no longer directly involved with the company, Anne and I speak frequently and remain close. Anne is an inspirational woman – with no formal education, no capital, and no experience, she started a single pretzel stand at a Pennsylvania farmer’s market and grew it into the world’s largest soft pretzel franchise. She did it all with a focus on giving back. She actually started the company to raise money for her husband to open a community counseling center. Her vision and values continue to guide us today. Second is Wendy Clark, currently the CEO AT DDB Worldwide and previously an executive a Coca-Cola. She's who I aspire to be – a powerful executive, mom, and wife. She is candid and real. I once heard her say there is no such thing as work-life balance, because that would mean a 50/50 split and that’s not realistic. This totally resonated with me because I’m always on, and I have to be because our stores are open pretty much all hours from coast to coast. I also admire Wendy because she knows what she believes in and she stands up for those beliefs, whether they’re popular or not. I appreciate her candor and honesty. I love the beach. After college, my best friend was moving to San Diego to take a new job and I decided to tag along with her. I really found a sense of peace and tranquility in the beach and it’s something I relish to this day. I don’t relax very often (or very well), but there’s something about the beach that allows me to just take a deep breath, listen to the waves and find an inner calm. 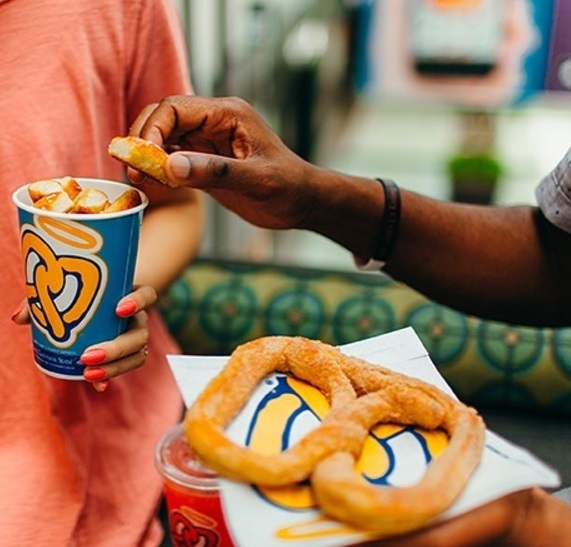 Auntie Anne’s pretzels, of course! As far as I’m concerned, that’s the only acceptable answer to this question. The hard part is choosing which pretzel is my favorite. Right now, I’d go with our Original Pretzel Nuggets and the surprisingly spicy Hot Salsa Cheese Dip. When I’m craving something sweet, I choose the Sweet Almond Pretzel, paired with our Caramel Dip. I’m passionate about people. I love what I do, I love helping people maximize their potential. I love to help people – Auntie Anne’s is made up of many amazing people and I feel so very fortunate to do what I love every day. I’m also passionate about health and exercise. I’m an avid runner. I’ve completed several full marathons, many half marathons, several duathlons, and countless shorter races. Whenever I’m home, which, to be honest, isn’t that often, I run with my neighbor at 5:30 every morning. When I’m on the road, I start my day with a run, sometimes outside, sometimes on a hotel treadmill. My goal for 2017 is to run 100 miles each month. Through May, I’m 5 for 5, and June is looking good so far!